डिज़्नी Princess re-desgin dresses. In a टिप्पणी दे. 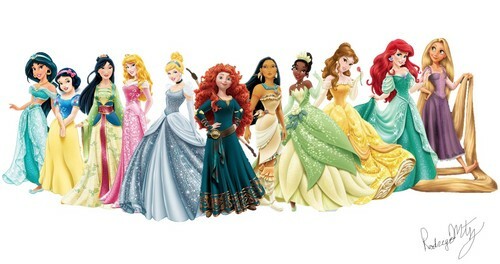 HD Wallpaper and background images in the डिज़्नी प्रिन्सेस club tagged: disney princess 2013. Some of the re designs were nice and it was pretty hard to find good ones to make this line-up. Jasmine, Mulan, Aurora, and Tiana are the same. Snow White minor changes to the dress. Merida's re re desgin. Pocahontas took off the makeup and added her mothers necklace. Belle less make up and cut one strand of hair. Ariel tried giving her no sleeves. Cinderella dress color change. Rapunzel I like this version better that and I could find a specific one I wanted when I do :D.
I love that you added Pocahontas' mother's necklace. I think it was awful how they altered it.